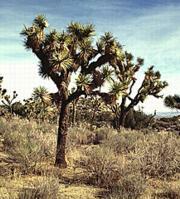 habitat of the Joshua Tree is similar to one of the palm trees. The Joshua Tree bears 1.25 to 1.5 inch flowers that are a creamy yellow and green. The flower is bell shaped, and has many 12 to 18 inch clusters on each branch. There is a very unpleasant odor that goes along with the flower. Some Joshua Trees do not flower annually. The fruit of the Joshua Tree is green and brown, and is 2.5 to 2 inches long. Soon after the Joshua Tree Tree's fruit matures in late spring, it will fry and fall off the branches. When the fruit falls it lets off many flat seed. The Joshua Tree grows in arid deserts; they often grow in groups called groves. The Joshua Tree can be found in the Mojave Desert with elevations from 2,000 to 6,000 feet. The Joshua Tree has two sets of root systems, one stores any surplus water and it also develops bulbs. The bulbs are buried 10 to 30 feet under the soil. Sometimes they reach up to 4 feet in circumference and weigh up to 40 pounds. The other set is a shallow root system; the shallow roots only reach down to a couple of feet. The spiny leaf of the Joshua Tree is turned upwards in hopes it will catch any moisture in the air. Then it stores the water in the limbs and trunk. The Joshua Tree is only pollinated by the Pronuda Moth. The moth is commonly called the Yucca Moth. The moth evolved special organs so that it is possible for the moth to pollinate the Joshua flower. The larvae of the Yucca Moth feed on the seeds of the Yucca. The Joshua Tree could not reproduce without the moth's pollination and likewise the moth is equally dependent on the tree. Both people and animals have relied on the Joshua Tree for survival. The Indians would remove the rope-like centers from the limbs to use as canisters for nuts and berries. They also used the lightweight bark for dishes and bowls. As far back as 1883 the pulp of the Joshua Tree was used to make paper for the London Daily Telegraph. During WWI, the U.S. government used the strong wood as splints for injured soldiers. The pioneers used the Joshua Tree as fence posts, and roasted parts of the tree and gave it to children for a sugary treat. The Joshua tree is plentiful in the wild but only grows in the Joshua Tree National Park. The Joshua Tree is protected by the U.S government and you must have permission to cut one down even if it is on your own property. Priit J. Vesilind. "The Sonoran Desert" National Geographic. Sept 1994: 37.